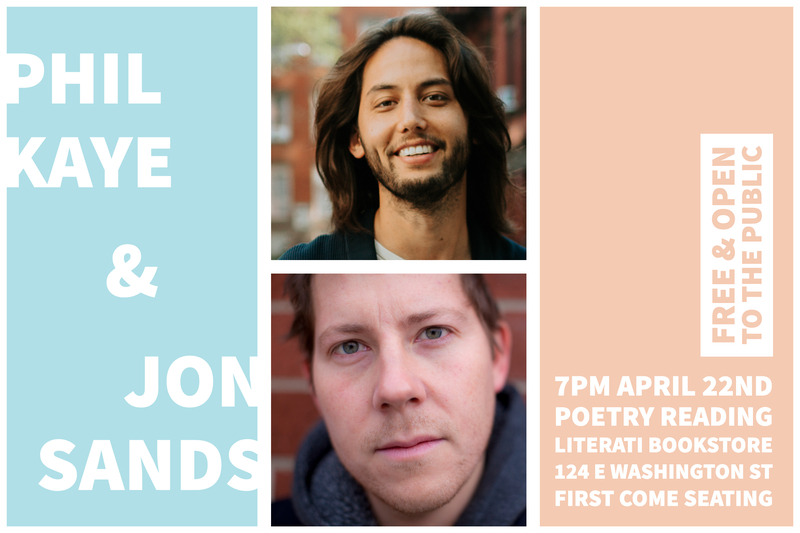 Literati is excited to welcome poets Phil Kaye and Jon Sands who will be reading from their latest collections Date & Time and The New Clean. Jon Sands has traveled into a ridiculous world, where nothing is too hilarious to not be honest, and nothing is too honest to not get you pregnant. Best of all, he's packed us in his suitcase. He represents an ever-changing population of those raised elsewhere who find themselves beckoned by the history, mystique, and magic-makers of New York City. These poems inhabit their own contradictions, and exquisitely navigate the many complicated sides of what it means to be alive. Phil Kaye is a Japanese-American poet. His work has been featured in settings ranging from The New Yorker to NPR to the Museum of Modern Art in New York City. He has performed his work in eighteen countries and was invited to open for His Holiness The Dalai Lama for the celebration of his 80th birthday. A former teacher of weekly poetry workshops in maximum security prisons, Phil was the head coordinator of Space in Prisons for the Arts and Creative Expression (SPACE). Phil is a National Poetry Slam finalist, and his book, Date & Time, was published in 2018 by Button Poetry. Jon Sands is a poet and fiction writer. He was a winner of the 2019 National Poetry Series, selected for his second book, It's Not Magic, forthcoming from Beacon Press in the fall of 2019. He is the author of The New Clean (Write Bloody Publishing, 2011), and the co-host of The Poetry Gods Podcast. His work has been featured in the New York Times, published widely, and anthologized in The Best American Poetry. He's also represented New York City multiple times at the National Poetry Slam. He lives in Brooklyn.